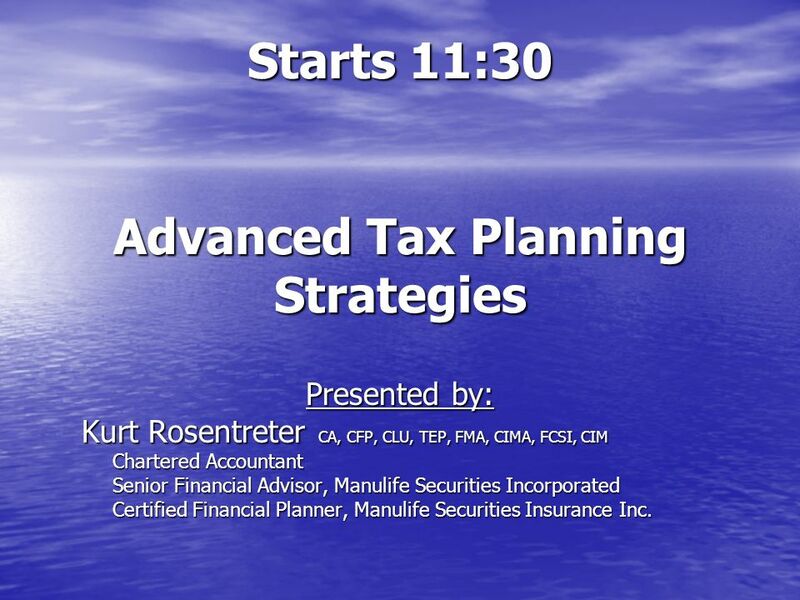 Starts 11:30 Advanced Tax Planning Strategies Presented by: Kurt Rosentreter CA, CFP, CLU, TEP, FMA, CIMA, FCSI, CIM Chartered Accountant Chartered Accountant. 1 Starts 11:30 Advanced Tax Planning Strategies Presented by: Kurt Rosentreter CA, CFP, CLU, TEP, FMA, CIMA, FCSI, CIM Chartered Accountant Chartered Accountant Senior Financial Advisor, Manulife Securities Incorporated Senior Financial Advisor, Manulife Securities Incorporated Certified Financial Planner, Manulife Securities Insurance Inc. Certified Financial Planner, Manulife Securities Insurance Inc.
2 About Kurt Rosentreter Chartered Accountant Chartered Accountant Twenty years of experience in personal finance. Twenty years of experience in personal finance. 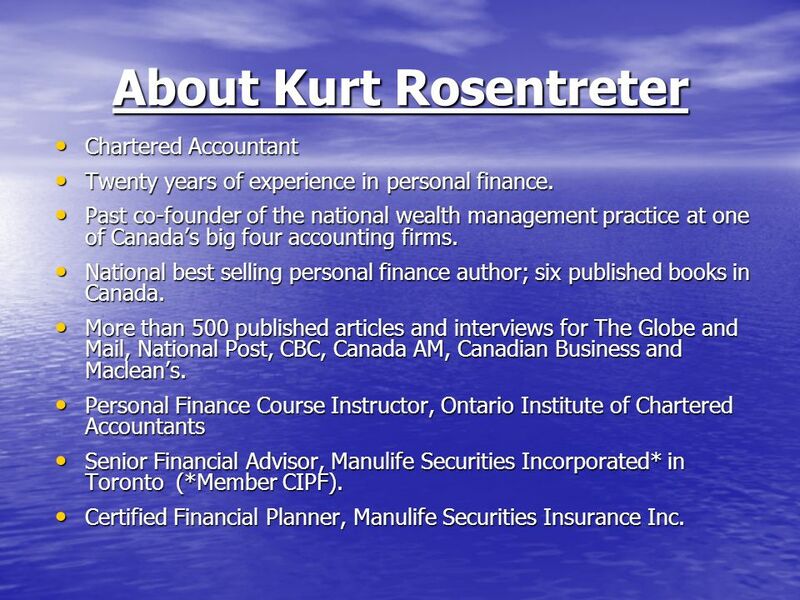 Past co-founder of the national wealth management practice at one of Canadas big four accounting firms. Past co-founder of the national wealth management practice at one of Canadas big four accounting firms. National best selling personal finance author; six published books in Canada. National best selling personal finance author; six published books in Canada. More than 500 published articles and interviews for The Globe and Mail, National Post, CBC, Canada AM, Canadian Business and Macleans. More than 500 published articles and interviews for The Globe and Mail, National Post, CBC, Canada AM, Canadian Business and Macleans. Personal Finance Course Instructor, Ontario Institute of Chartered Accountants Personal Finance Course Instructor, Ontario Institute of Chartered Accountants Senior Financial Advisor, Manulife Securities Incorporated* in Toronto (*Member CIPF). Senior Financial Advisor, Manulife Securities Incorporated* in Toronto (*Member CIPF). Certified Financial Planner, Manulife Securities Insurance Inc. Certified Financial Planner, Manulife Securities Insurance Inc.
3 Complete a Draw Ballot! Draw for four books at the end of this 30 minute presentation Draw ballots available at front of room Drop in basket at front of room Only completely filled out ballots will be winners. 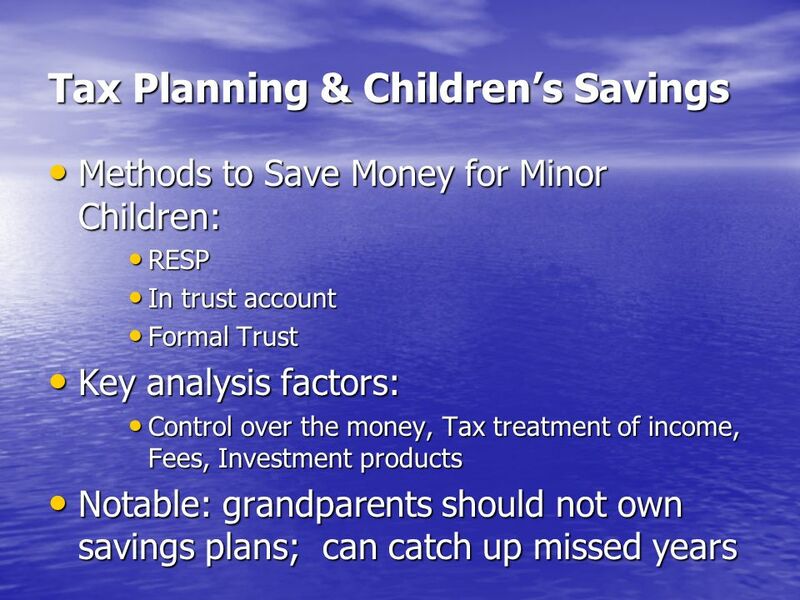 5 What is tax planning? Tax planning vs. tax return preparation – not the same Tax planning vs. tax return preparation – not the same What tax planning is not… What tax planning is not… Should you prepare your own tax return? Should you prepare your own tax return? How do you recognize an expert tax planner? How do you recognize an expert tax planner? What does it cost to hire an expert tax planner? What does it cost to hire an expert tax planner? 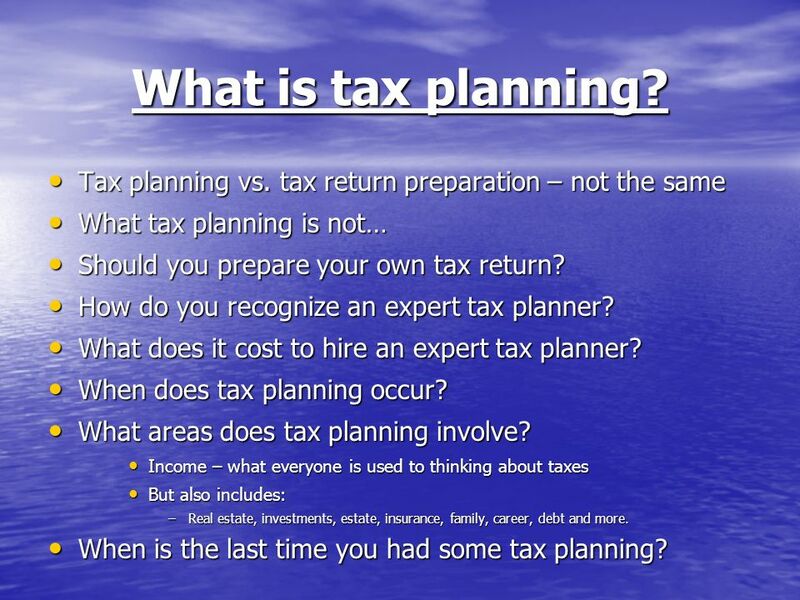 When does tax planning occur? When does tax planning occur? 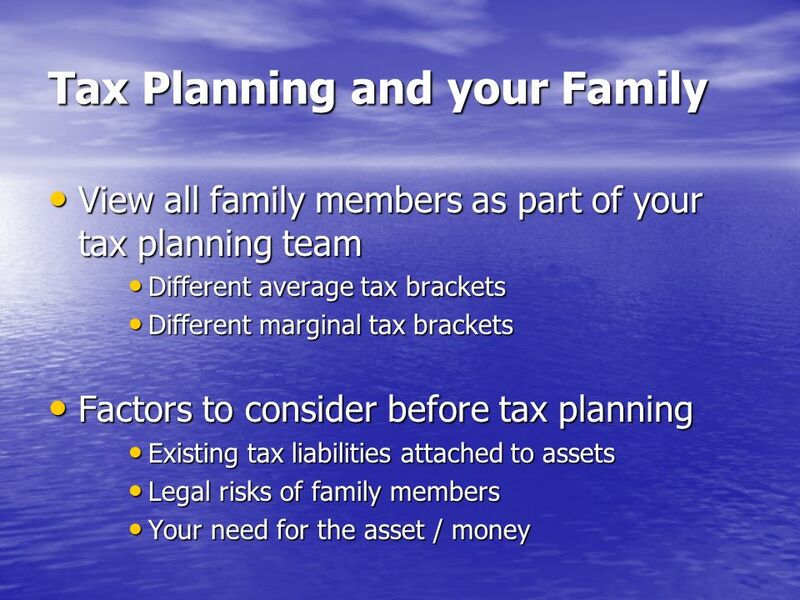 What areas does tax planning involve? 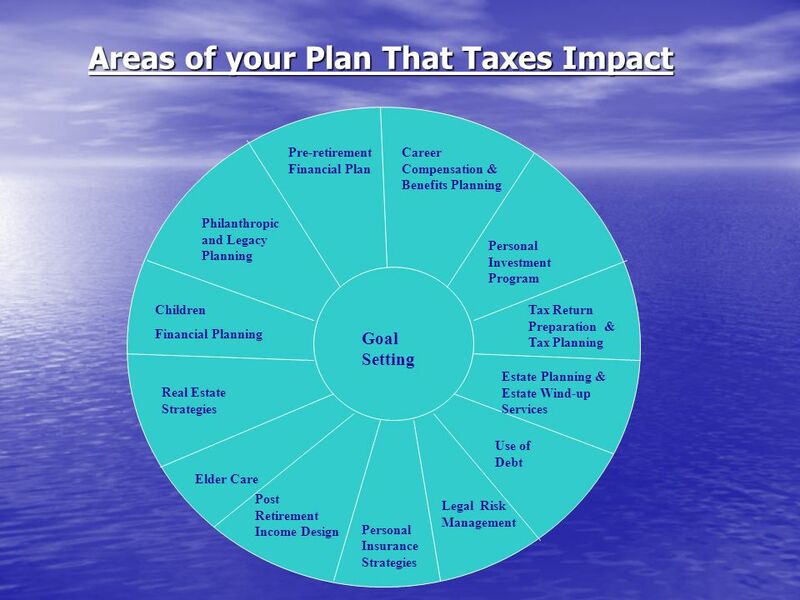 What areas does tax planning involve? 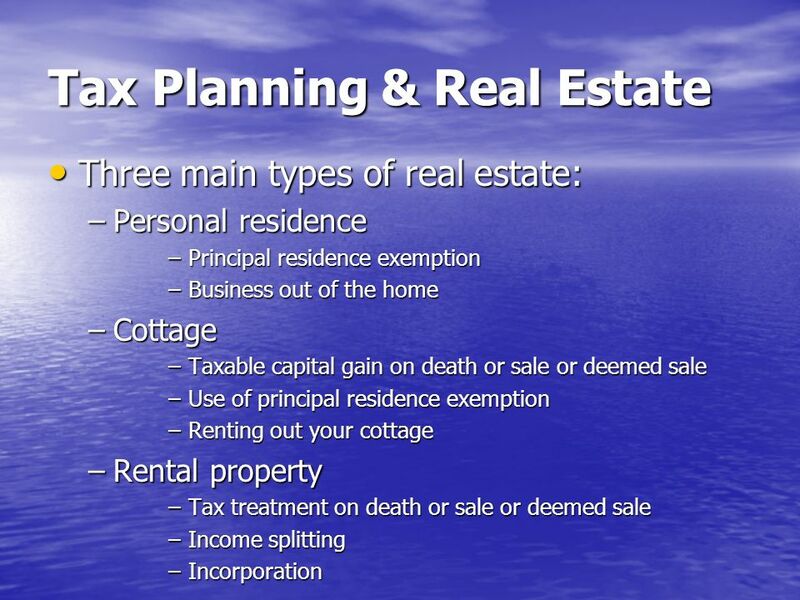 Income – what everyone is used to thinking about taxes Income – what everyone is used to thinking about taxes But also includes: But also includes: –Real estate, investments, estate, insurance, family, career, debt and more. When is the last time you had some tax planning? When is the last time you had some tax planning? 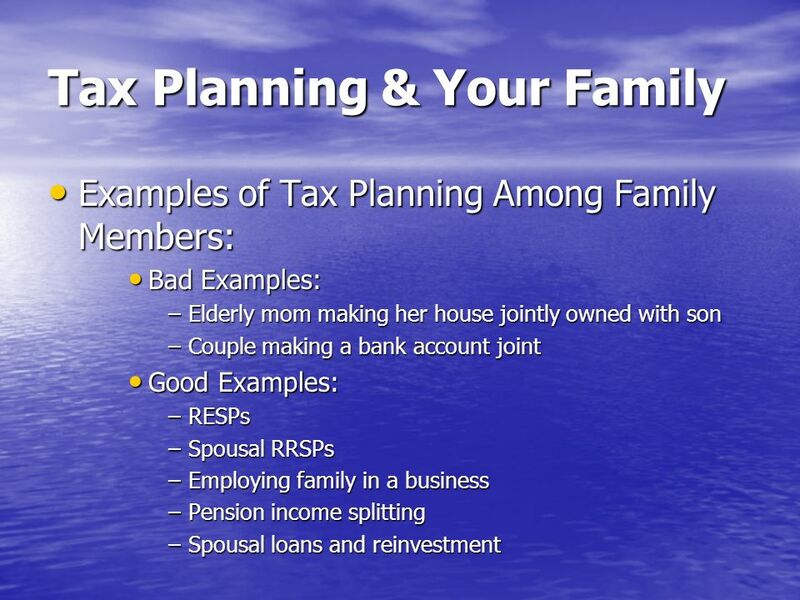 9 Tax Planning & Your Family Beware Joint Ownership and Gifting for tax breaks!!! 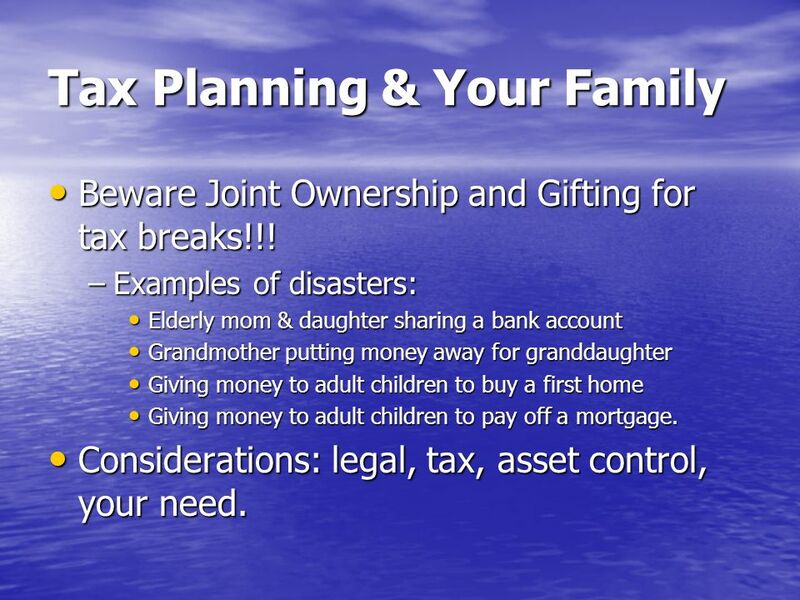 Beware Joint Ownership and Gifting for tax breaks!!! –Examples of disasters: Elderly mom & daughter sharing a bank account Elderly mom & daughter sharing a bank account Grandmother putting money away for granddaughter Grandmother putting money away for granddaughter Giving money to adult children to buy a first home Giving money to adult children to buy a first home Giving money to adult children to pay off a mortgage. Giving money to adult children to pay off a mortgage. Considerations: legal, tax, asset control, your need. Considerations: legal, tax, asset control, your need. 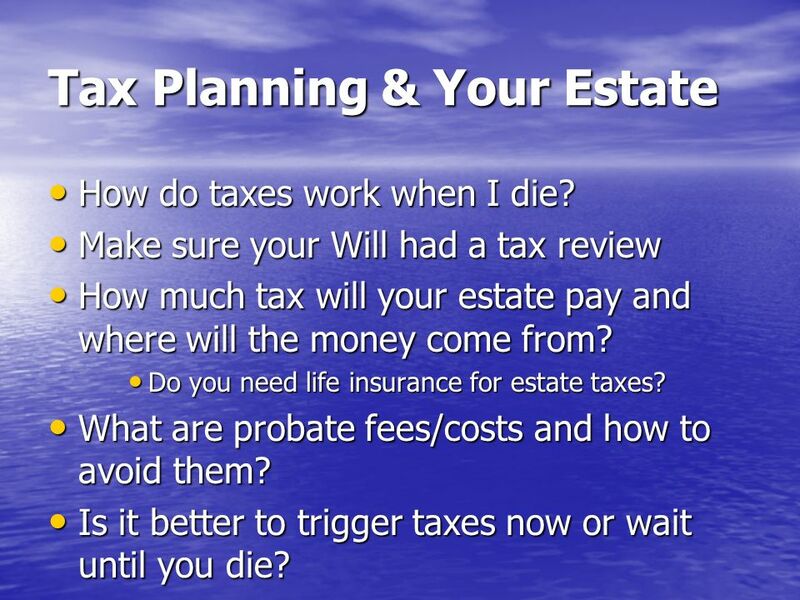 15 Tax Planning & Your Estate How do taxes work when I die? How do taxes work when I die? Make sure your Will had a tax review Make sure your Will had a tax review How much tax will your estate pay and where will the money come from? How much tax will your estate pay and where will the money come from? Do you need life insurance for estate taxes? Do you need life insurance for estate taxes? What are probate fees/costs and how to avoid them? What are probate fees/costs and how to avoid them? Is it better to trigger taxes now or wait until you die? Is it better to trigger taxes now or wait until you die? 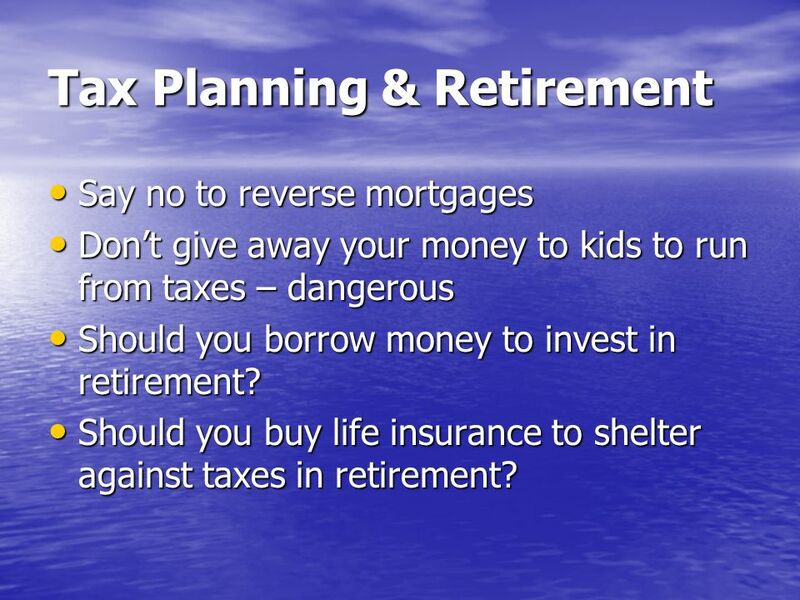 17 Tax Planning & Retirement Say no to reverse mortgages Say no to reverse mortgages Dont give away your money to kids to run from taxes – dangerous Dont give away your money to kids to run from taxes – dangerous Should you borrow money to invest in retirement? Should you borrow money to invest in retirement? Should you buy life insurance to shelter against taxes in retirement? Should you buy life insurance to shelter against taxes in retirement? 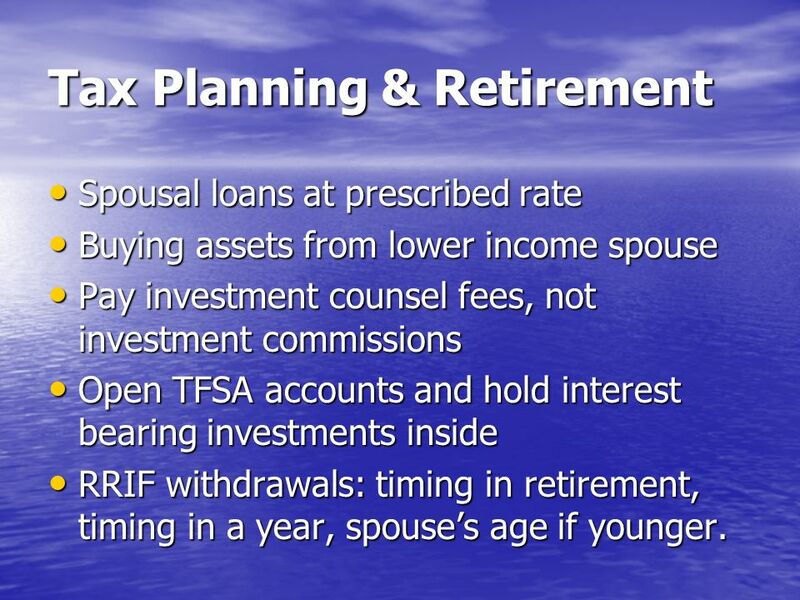 18 Tax Planning & Retirement Spousal loans at prescribed rate Spousal loans at prescribed rate Buying assets from lower income spouse Buying assets from lower income spouse Pay investment counsel fees, not investment commissions Pay investment counsel fees, not investment commissions Open TFSA accounts and hold interest bearing investments inside Open TFSA accounts and hold interest bearing investments inside RRIF withdrawals: timing in retirement, timing in a year, spouses age if younger. RRIF withdrawals: timing in retirement, timing in a year, spouses age if younger. 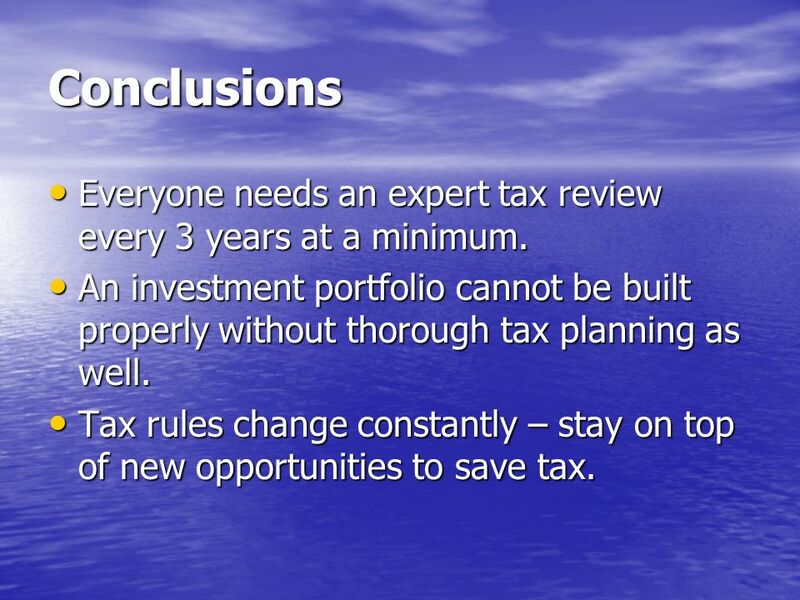 19 Conclusions Everyone needs an expert tax review every 3 years at a minimum. Everyone needs an expert tax review every 3 years at a minimum. 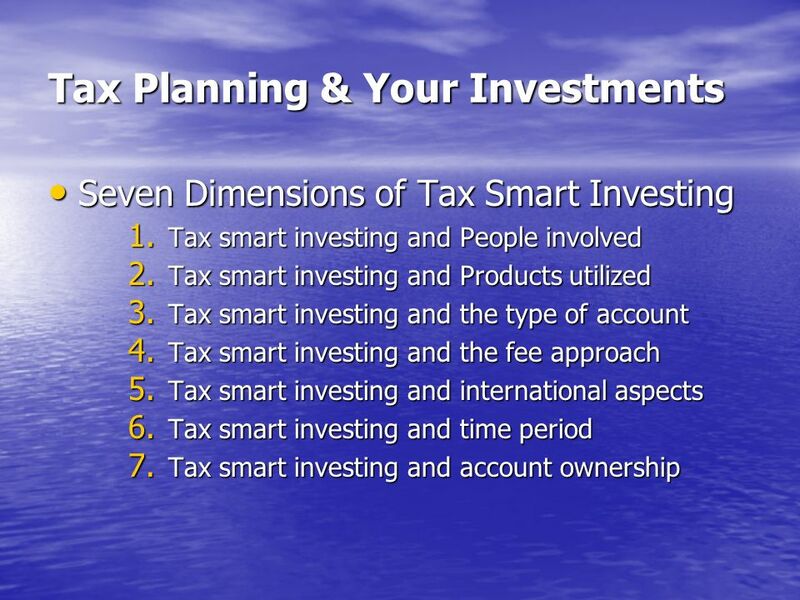 An investment portfolio cannot be built properly without thorough tax planning as well. 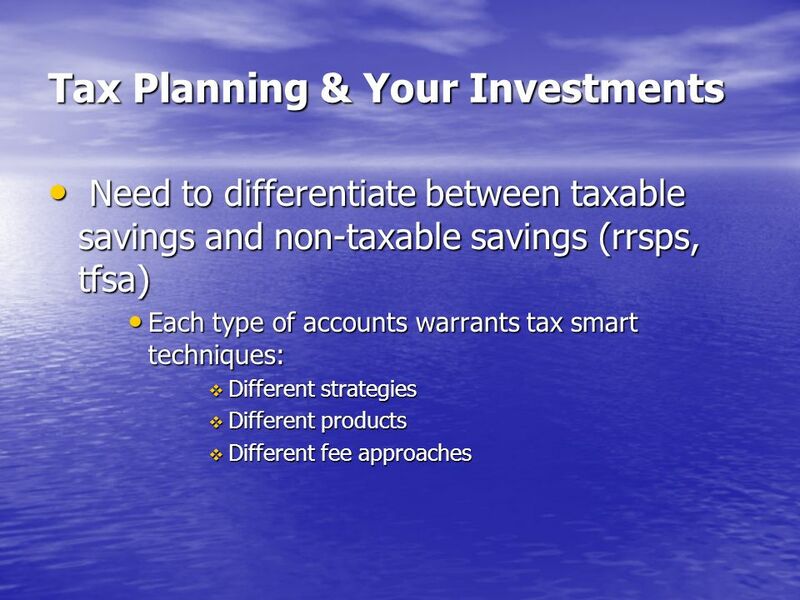 An investment portfolio cannot be built properly without thorough tax planning as well. Tax rules change constantly – stay on top of new opportunities to save tax. Tax rules change constantly – stay on top of new opportunities to save tax. 20 Complete a Draw Ballot! 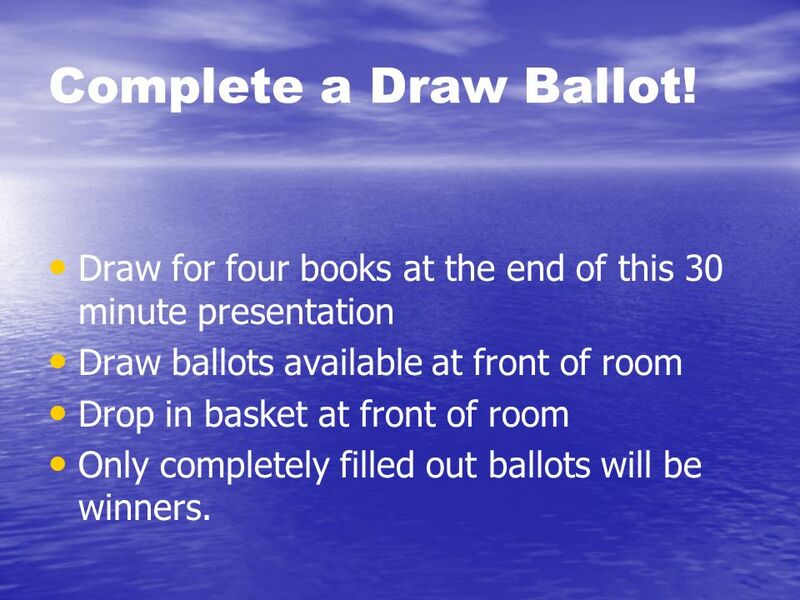 Draw for four books at the end of this 30 minute presentation Draw ballots available at front of room Drop in basket at front of room Only completely filled out ballots will be winners. 21 Thank You. 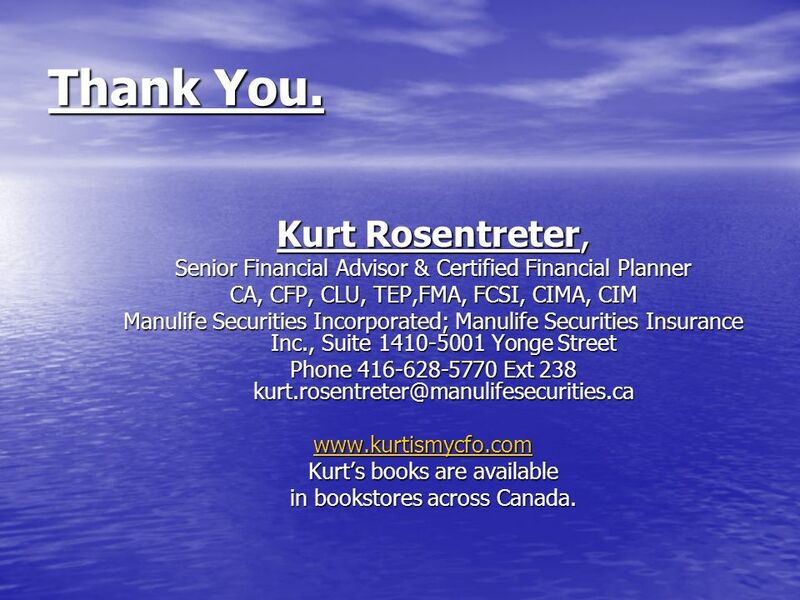 Kurt Rosentreter, Senior Financial Advisor & Certified Financial Planner CA, CFP, CLU, TEP,FMA, FCSI, CIMA, CIM Manulife Securities Incorporated; Manulife Securities Insurance Inc., Suite 1410-5001 Yonge Street Phone 416-628-5770 Ext 238 kurt.rosentreter@manulifesecurities.ca www.kurtismycfo.com Kurts books are available in bookstores across Canada. 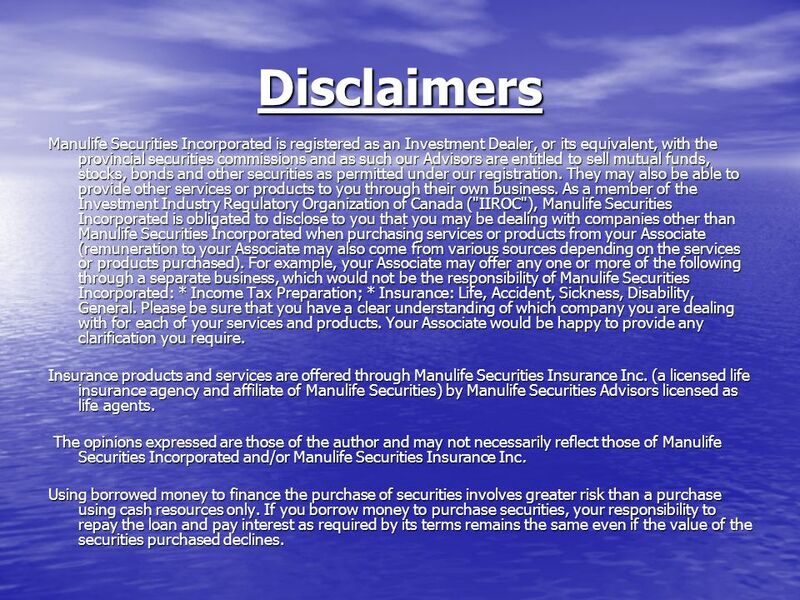 22 Disclaimers Manulife Securities Incorporated is registered as an Investment Dealer, or its equivalent, with the provincial securities commissions and as such our Advisors are entitled to sell mutual funds, stocks, bonds and other securities as permitted under our registration. They may also be able to provide other services or products to you through their own business. As a member of the Investment Industry Regulatory Organization of Canada ("IIROC"), Manulife Securities Incorporated is obligated to disclose to you that you may be dealing with companies other than Manulife Securities Incorporated when purchasing services or products from your Associate (remuneration to your Associate may also come from various sources depending on the services or products purchased). For example, your Associate may offer any one or more of the following through a separate business, which would not be the responsibility of Manulife Securities Incorporated: * Income Tax Preparation; * Insurance: Life, Accident, Sickness, Disability, General. Please be sure that you have a clear understanding of which company you are dealing with for each of your services and products. Your Associate would be happy to provide any clarification you require. Insurance products and services are offered through Manulife Securities Insurance Inc. (a licensed life insurance agency and affiliate of Manulife Securities) by Manulife Securities Advisors licensed as life agents. The opinions expressed are those of the author and may not necessarily reflect those of Manulife Securities Incorporated and/or Manulife Securities Insurance Inc. The opinions expressed are those of the author and may not necessarily reflect those of Manulife Securities Incorporated and/or Manulife Securities Insurance Inc. Using borrowed money to finance the purchase of securities involves greater risk than a purchase using cash resources only. If you borrow money to purchase securities, your responsibility to repay the loan and pay interest as required by its terms remains the same even if the value of the securities purchased declines. 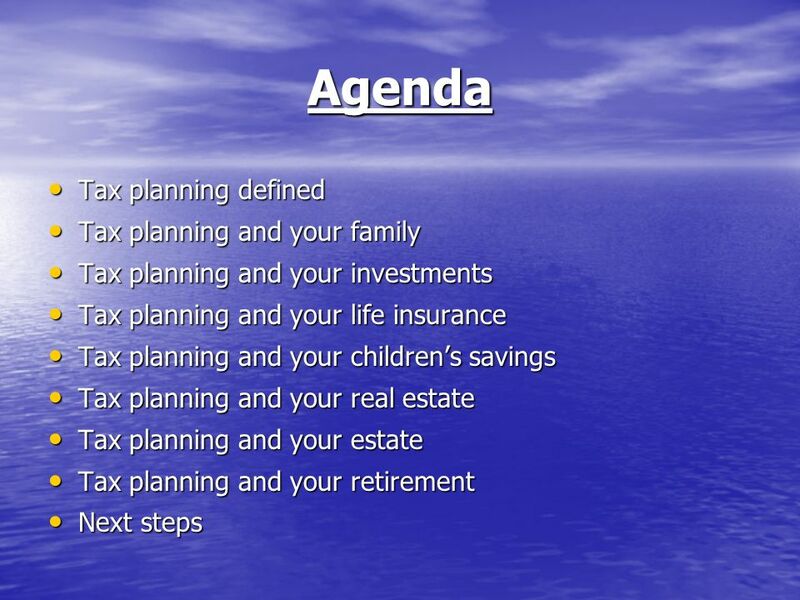 Download ppt "Starts 11:30 Advanced Tax Planning Strategies Presented by: Kurt Rosentreter CA, CFP, CLU, TEP, FMA, CIMA, FCSI, CIM Chartered Accountant Chartered Accountant." Ken Zawalykut | Phone: What Young. HOME Investment Management Inc is an Alberta based discretionary Portfolio Manager and Exempt Market Dealer, owned and operated by its principals. HOME. STYLUS Retirement Planning: Tax Presentation. 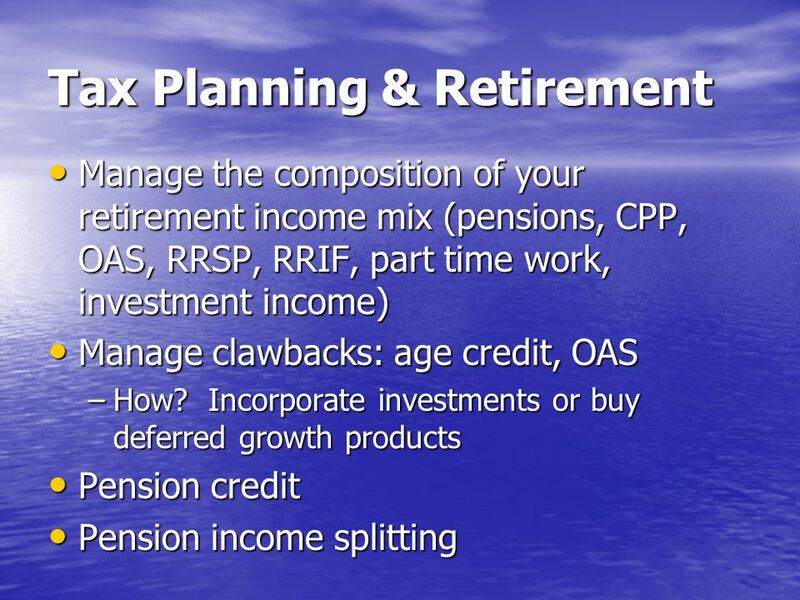 Presentation Overview Investment Income Splitting Private Business Ownership Tax Planning Considerations. Philanthropic solutions using Insurance & Annuities Produced in part by- Brenda McEachren Presented by: B.Comm,LLB, TEPDiana Frizell CFP Frizell & Co.
Pension Planning ONWAA 2012 Fall Assembly. The following material provides a basic understanding of pension terms, tools and benefits available. The list. R egistered R etirement S avings P lan (RRSPs). What is a RRSP ? An RRSP (Registered Retirement Savings Plan)  is a personal savings plan registered. Investing in your small business success. Agenda  Protecting your business  Banking outside the box  Investing in the future. ©UFS Financial Planning 101 Investment Advisory Services offered through Investment Advisor Representatives of MetLife Securities, Inc. (MSI), 200 Park. Retirement, Tax and Estate Planning Wealth Matters. 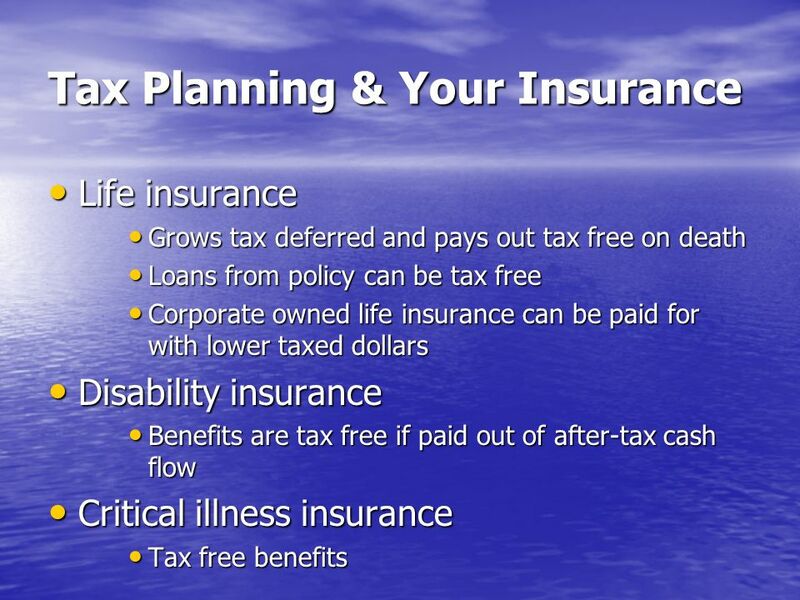 Taxes at Death Insurance Concepts. Tax on What you Own at Death When a taxpayer dies, they are subjected to paragraph 70(5) of the Income Tax Act which. Presented by: Business Continuity Planning Tom Pilkington CA CFP TEP National Estate and Tax Planning Consultant Ontario Regional Marketing Centre Keyperson. DISTINGUISH AND GROW YOUR PRACTICE WITH TAX-EFFICIENT INVESTING. Bill Johnstone, Vice President, Sales & Marketing.